If you find yourself wandering the beautiful rolling hills of Scotland, and are looking for some of the countries great historical sites, make a stop in Clackmannanshire for the Alloa Tower. The Alloa tower is a very well kept Keep dating back to the early fourteenth century and the Erskines family. This is the oldest known Scottish Keep and is in surprisingly great condition. The outside of the tower shows the classic and rustic style of buildings from the middle ages, while the interior is a bit more updated and gives off a feel of how the building has changed over the years of inhabitants. The building shows off a very powerful and sturdy feel outside, which is complimented by finely crafted furniture and art on the inside. Alloa Tower truly shows off the pride of Scotland and the heritage that makes it a popular travel destination for many months during the spring and summer. 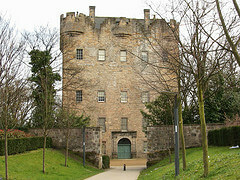 Tours are available nearly every day throughout most of the year, and are run by the National Trust of Scotland (NTS). NTS also offers many other tours of Scotland’s finest national landmarks and castles, and Alloa Tower can make a great stop on a tour of many of these fantastic sites. Last updated by RJ Horn on 11 December, 2011 in Destinations. I believe Alloa Tower is one of the largest surviving mediaeval towers in Scotland. Very interesting.